‘Buzz’ Pass Trip 13 – an extra, spontaneous adventure for 2018. The Manchester Bee Trail has opened my eyes! As a Manchester lass, born and bred, I thought I knew pretty much everything about the City, but I was surprisingly mistaken. The Football Museum, Manchester Youth Zone, Wythenshawe Forum, Croxton Park, The Aquatic Centre, Etihad Stadium, The People’s Museum, The Mackie Mayor, Saddler’s Yard, Clayton Hall and Plant Hill Park are just some of the places I have discovered whilst following the trail. It has also been an absolute joy to rediscover old haunts and regions where redevelopment and rejuvenation of the City have taken place and magically transformed many of them from derelict and dilapidated places into modern, inviting community areas for living, working and socialising – Angel Meadow, Spinningfields and Ancoats are wonderful examples. I was determined to travel by free Bus Pass to find the whole swarm – 101 big bees and 131 little bees, designed & decorated by local artists, schools and community groups and which will be auctioned off in October to raise money for the Lord Mayor’s fund. It proved to be an amazing adventure which took 9 days to complete and involved travelling on 26 Metrolink trams, 20 buses and 1 train, plus miles of walking! 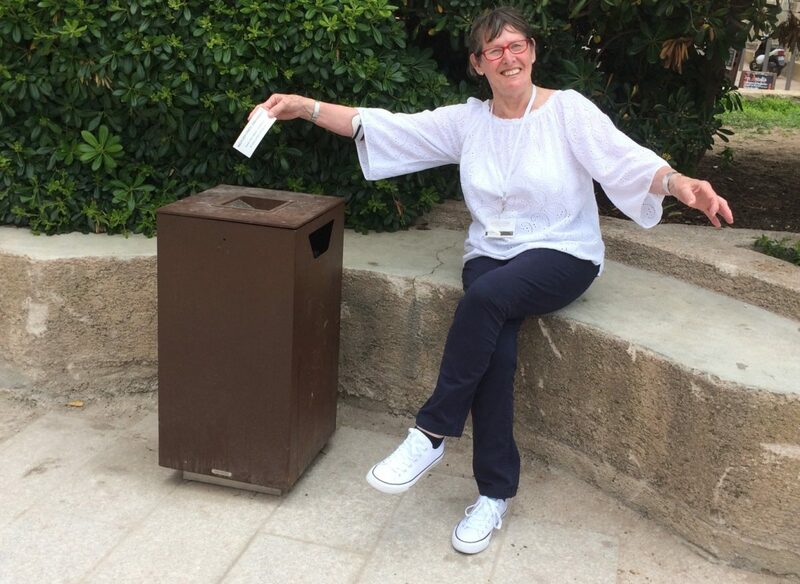 At each venue I managed to persuade passers-by to take my photograph and handed out dozens of cards advertising the #1PieceOfRubbish campaign. Along the way I met many very interesting and lovely people, e.g. a man from London spending 2 days in Manchester specifically to photograph the bees, a married couple from Dundee at the Lowry Theatre, lots of families with very excited children, a mum from the Isle of Wight visiting her son, Karen who ‘buzily’works in the Bee Shop at the Corn Exchange and a Polish lady who took my photograph at my 101st bee on Oxford Road and gave me a huge hug! This project has been a fantastic success and brought people of all ages, colours and creeds together, sharing their interest, enthusiasm and excitement at every newly-discovered bee. Congratulations, Manchester, for creating a BUZZ in the City and reinforcing my feeling of being ‘Manc & Proud’! Next Next post: “From Turkey With Love” – from 007!